Gelderland is divided into three regions: the Veluwe, the Betuwe and the Achterhoek or Graafschap. The Veluwe is a vast expanse of moors and wetlands, with hills covered in forests. It has several small lakes and the largest expanse of sand drifts in Europe. In the southern part of the region are a wildlife reserve and two parks: the Nationaal Park de Hoge Veluwe and the Veluwezoom. Both are 50 square kilometres in area, but the Nationaal Park is protected and charges an admission fee, while the Veluwezoom is free. 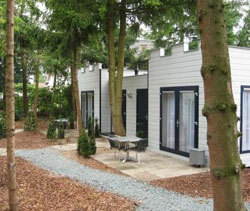 The Veluwe is a popular tourist attraction, and campsites all over the area are active the year round. Arnhem, the seat of the provincial government, is in the Veluwe. During World War II Gelderland was the site of heavy battles between German forces and the Allies, and the Battle of Arnhem in 1944 is the most famous of these. Allied troops failed to secure the area and had to surrender, but the town was liberated eight months later by Canadian troops. Notable institutions in the city include the open-air National Heritage Museum, which showcases antique Dutch homes and factories, the popular Burgers’ Zoo, and the football stadium the Gelredome. In the nearby city of Appeldoorn is the royal Het Loo Palace, where William III and Mary II lived. The Betuwe is an island between the Waal and Rhine/Lek rivers. The land is protected from the rivers by dikes, though the rivers occasionally threaten to overflow and flood the area. The Betuwe is noted for its abundance of market gardens, fields and cherry and apple orchards. 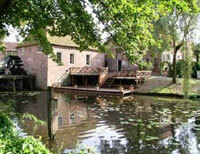 Achterhoek is the easternmost part of Gelderland, mostly rural, with farmlands and forests covering most of the region. The world-famous Grolsch beer is brewed in Achterhoek. Gelderland’s provincial government emphasizes the need for affordable housing. Municipalities that agree to construct cheaper residential areas receive incentives, on the condition that the housing is of good quality.